Who says sushi can’t be vegan? The building itself is interesting, with a modern-Japanese design. There are hints of the traditional with a futuristic feel. The architecture inside really tricks you; the centre of the restaurant has a skylight and cubes made of glass and mirrors, so it takes you a while to work out what is actually the ceiling. 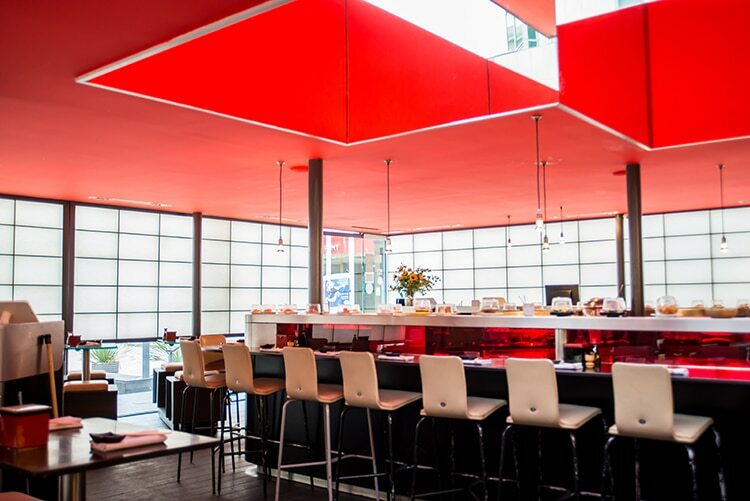 It’s a spacious well-lit restaurant, with a sense of theatre coming from the conveyor belt boasting small beautiful plates of food weaving its way through the space. Seating has been carefully positioned so you can either sit at the conveyor belt or beside it if there’s a group of you. There’s decking outside which is called the Hiroba deck, the idea around which is to emulate sitting on tatami mats in Japan. Perfect for some alfresco dining! I’ve heard you can hire the whole of the Hiroba deck out for parties or as a stage for performances. 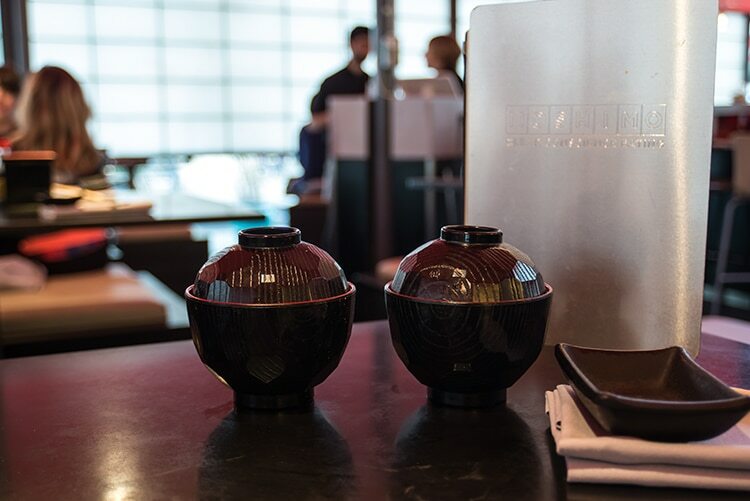 Moshimo prides itself with its sustainable ethos, and a way in which they follow this practice is by following the “omakase” principle. This is a Japanese tradition around eating which means the chefs create their menu according to what’s readily available based on the seasons. This ensures you’re eating the freshest of ingredients and minimises food waste. It does mean that the menu changes frequently, so if you like the sound of some of the dishes I go on to talk about, get over there quick! They are also part of Too Good To Go, an app that minimises food waste in restaurants and cafes, allowing people using the app to purchase discounted food at the end of service. We were seated beside the conveyor belt so we got to admire all the pretty dishes move past us, but as delicious they looked what caught our eye was on the menu. 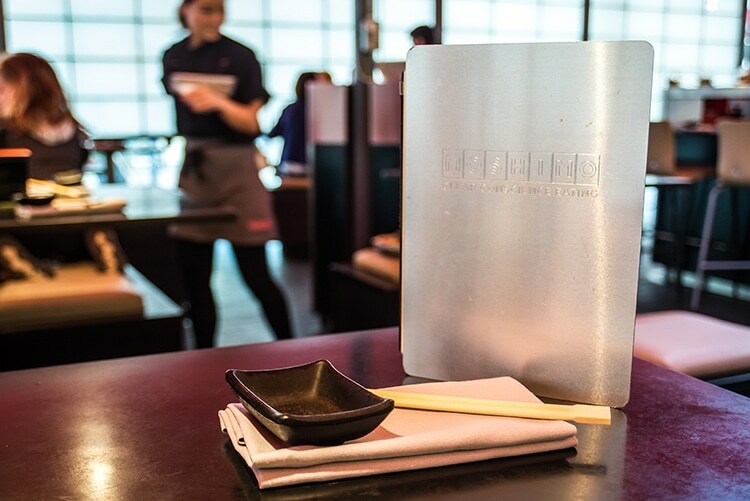 I might point out here that the menu was quite special too, not just a sheet of paper, but a sliver metal case encapsulating the menu for you to peruse. For drinks, we ordered a Matcha soya milk shake (£3.10), made with the powdered green tea leaf used in Japanese tea ceremonies, one of the most powerful known antioxidants, and a ‘Puffed rice’ genmaicha green tea (£2.25), which was a sencha green tea with roasted brown rice giving aromas truly evocative of Japan. I loved the heavy metal teapot that came with a little teacup. The attention to detail was very much appreciated. I also enjoyed the fact that there was a box of pickled ginger and a small pot of wasabi to accompany your food. The Matcha shake was fresh and earthy, and the tea had a beautiful lightness to it. You could taste the puffed rice flavour which was almost nutty. A lovely accompaniment to the meal that followed. To start we ordered their Classic miso soup (£1.90) made with their super-healthy konbu seaweed dashi, served with tofu & wakame. Along with the Seasonal miso soup (£2.60) which was wild mushroom and carrot. These were delicious little bowls of flavour, a lovely start to the meal. 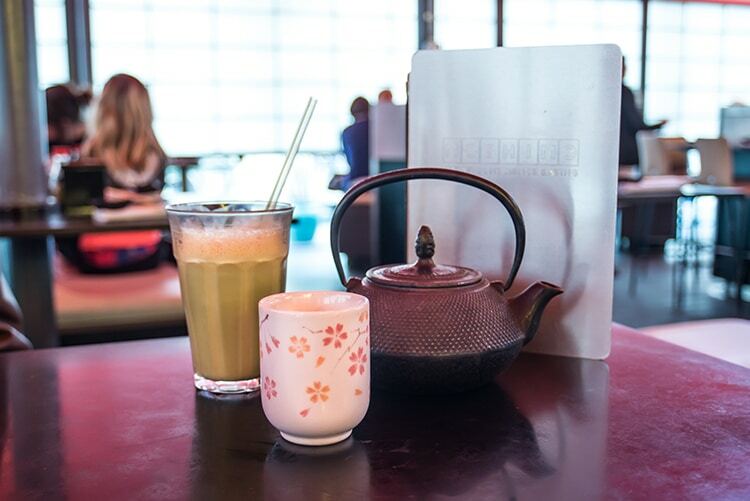 The seasonal miso had a subtle kick which was inviting to the palate. 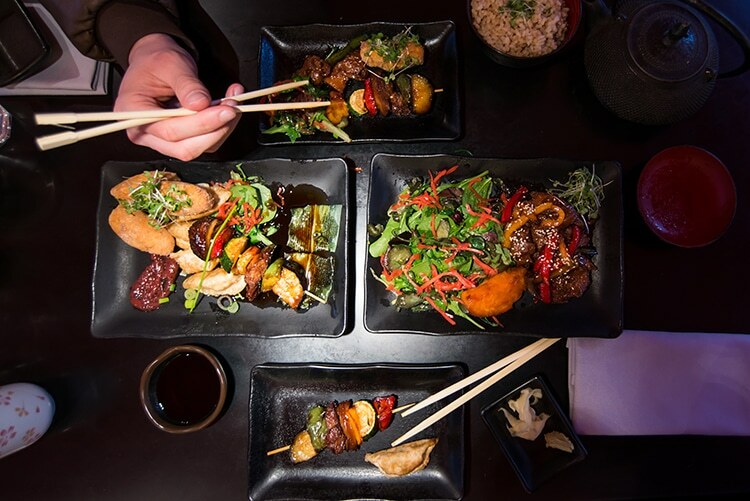 For the main food, we liked the sound of the Yakiyasai sharing platter (£11.80); a selection of kushi vegetable skewers, vegetable gyoza and sweet potato & peanut tofu balls, and from our waiter’s recommendation we also ordered the Vegan kamo duck teriyaki (£11.95). Morsels of Vbites vegan duck in their much- loved teriyaki sauce. Served with mixed baby leaf salad and sweet potato. When the food arrived, the colours were stunning! The shapes and textures were so welcoming, I couldn’t wait to tuck in. The plum sauce on the sharing platter really stood out to me, as it was a flavour combination I wasn’t familiar with but really enjoyed it. Think sweet plums with a saltiness, it worked perfectly with the sweet potato and tofu croquettes. The vinaigrette dip was lovely with the crispy vegetable gyoza too. I’d like to point out the aubergines on the skewers, another new taste experience. They were melt-in-the-mouth tender with a sweetness to them, like they had been fried in honey. The duck that had been used for the kamo duck teriyaki would have fooled many with its close resemblance in texture and flavour to the real thing. And the sweet, sticky and dark sauce was so moreish. The salad that accompanied the duck had been dressed with pink pickled ginger and gherkins, which tasted nothing like your jar of pickled gherkins, a lot better (and I love a pickled gherkin from a jar!). These you could tell were prepared in their house recipe for pickling and fermenting. 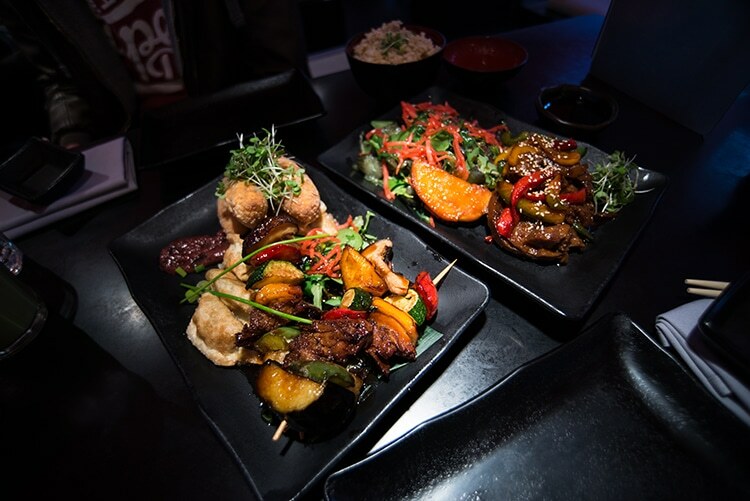 We were filling up nicely on such enjoyable food, I loved that it was introducing me to new flavours and combinations. And you could really tell the ingredients were fresh. 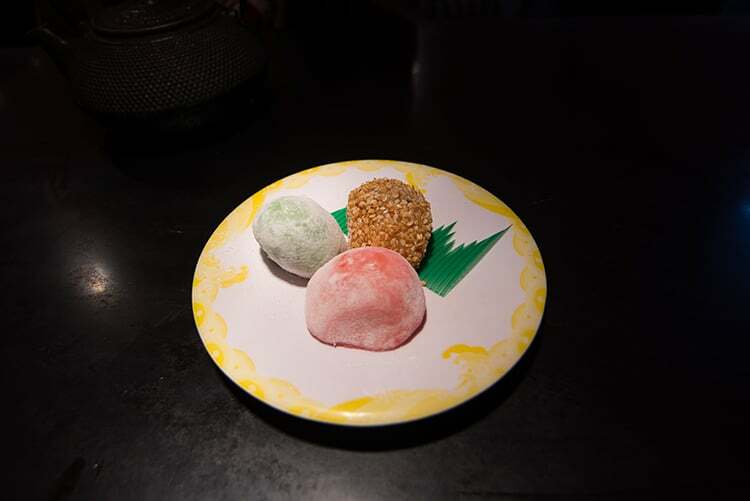 Once we had finished, our waiter asked if we’d be interested in trying the Small Mochi Rice Cakes (£4.10), three smaller mochi cakes with a variety of fillings such as mung bean & red adzuki bean, chopped peanuts, and coconut. So we decided to share a plate of them. If you aren’t familiar with mochi cakes you must try them, they aren’t like much else to compare them to, they’re so individual and original they really must be tried! They’re made by pounding rice to a soft paste, which gives a spongy, chewy texture which usually have sweet fillings that are a pleasant surprise when you bite into them! 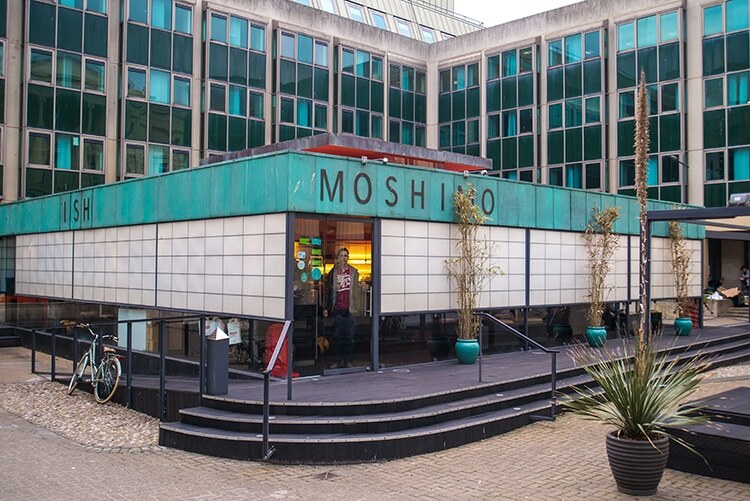 Moshimo is a great place anytime of day with anyone. We had visited after work on an early Wednesday evening. There were a few families eating with the little ones getting excited about the conveyor belts, and as the evening went on a few groups of friends came in and a couple of dates. I would love to go back on a warm day to experience their Hiroba deck in the sun.